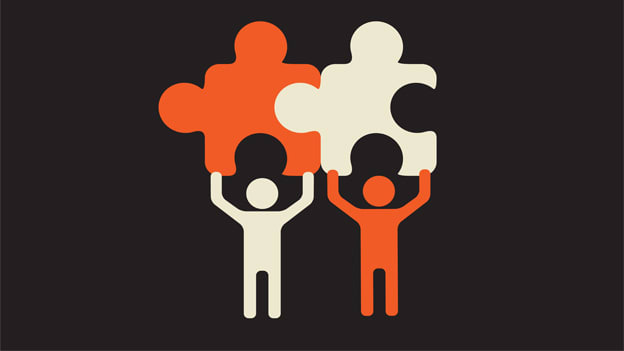 Meaningful organizational change is the result of an optimum mix of several catalytic factors. Some of them are internal and largely controllable, whereas, others are external and primarily uncontrollable due to their susceptibility to outside influences. The desire to elevate an organization to a preferred level has the nobility of purpose which demands replenishment with fresh ideas. Consequently, the Change Equation deserves another look at being adjusted for further robustness as a facilitative tool in countering the high incidences of failure rates in organizations trying to attain the change objectives. This refers to the pervasiveness of a continuous improvement mindset within the fabric of a progressive organization. It has to go beyond the reactive temperament of ubiquitous dissatisfaction with the status quo as a primary driver for change. Such an impetus requires a proactive disposition that derives its strength from Frederick Herzberg’s Motivation-Hygiene Theory* that postulates the principle of ‘Absence of Dissatisfaction Doesn’t Equal Satisfaction’. Therefore, the case for creating an ‘Urgency to Change’ should be based upon the unrelenting and congruent organizational desire to excel, regardless of the status quo, through appropriate means by nullifying the idiom of ‘if it ain’t broke, don’t fix it’ and embodying the ‘disruptive’ approach. This refers to stepping away from the abyss of defining an idealistic vision that projects the ‘mirage’ for embarking upon doomed initiatives. It requires due diligence of an organization’s capabilities with respect to the ‘mobilizable’ resources, availability of ‘prodigious’ talent, and prevalence of ‘scrumptiously’ favorable factors for business in the foreseeable future. It demands an ‘enlightened’ leadership that is cognizant of its organizational strengths and is endowed with the humility to accept shortcomings with a ‘productive’ attitude that incentivizes progressive behaviors. It is manifested in the form of a documented map, easily understood and fervently supported by key stakeholders, of the desired possibilities that reflect a realizable state of ‘significantly elevated’ achievements within an acceptable margin of error. This refers to the incisive and systematic approach in managing change with associated risks through clearly delineated steps by either deploying a proven model by prominent thought leaders/practitioners, e.g., Kurt Lewin, John Kotter, Jeff Hiatt, etc. or developing a customized version that is imbued with the specific organizational dynamics. It should exhibit the resistive capabilities of ‘Teflon®’, in terms of deflecting all forms of passive and active resistance and should be well understood by its proponents while having the ‘osmotic’ properties to seep into the organizational culture as a key enabler of excellence. It should have the longevity to outlast ‘fad-surfing’ and represent the ‘Kevlar®’ that easily defeats the noticeable/subtle/disguised FUD* attacks from ‘Machiavellian’ forces vying to plot, program and pronounce its failure. This refers to the collective set of vibrant employee behaviors that symbolize the proclivity to achieving successful change, and are the extrinsic manifestations of an integrity-driven demeanor that harnesses positive attitudes with the requisite knowledge, skills, and competencies to achieve the desired goals. The tendency to bring about meaningful change is an intrinsic humanistic characteristic that varies in its intensity from one employee to another due to inherent individualistic complexities/extenuating circumstances. Consequently, it has more weight over the ‘mechanized’ actualization of leadership dicta that are ceremoniously disguised within the emblems of organizational solidarity through a publicized ‘buy-in’ from ‘accommodating’ employees fearful of a backlash from ‘lurking’ power brokers. A key success factor to watch in this context is the ‘extravagant’ display of Organizational Citizenship Behaviors (OCBs). 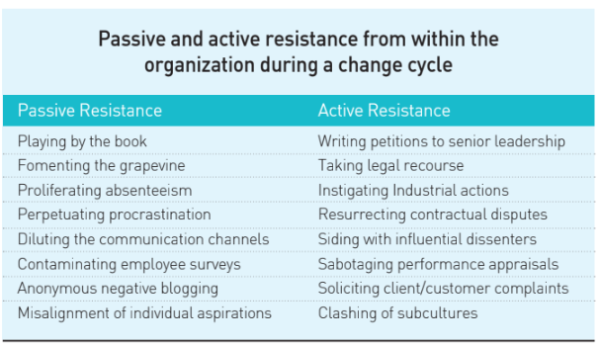 This refers to the passive and active resistance aspects that pop up during various stages of the change cycle from within the organization. They can either be unintentional or intentional in nature. 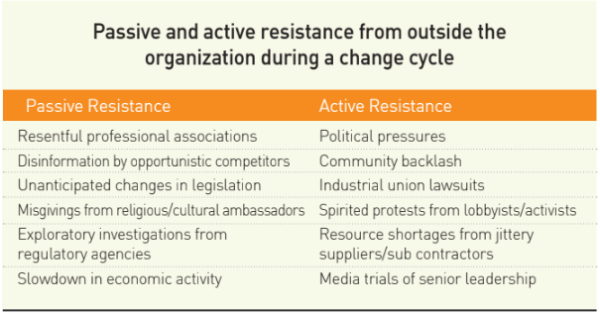 This refers to the passive and active resistance aspects that pop up during various stages of the change cycle from outside the organization. They can either be unintentional or intentional in . Don’t forget to ‘CLAP’ your way to success! NEXT STORY: What can an AI chatbot do for recruitment?